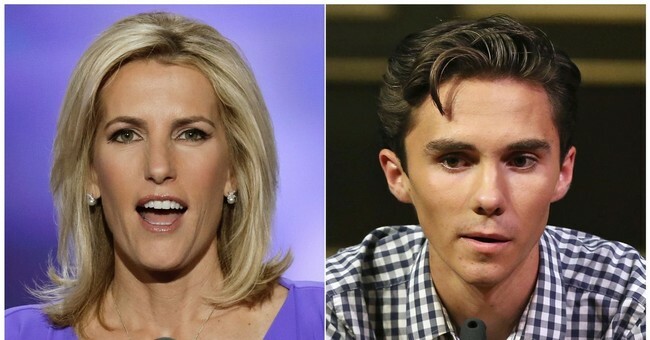 Fox News is standing by Laura Ingraham, the host of the network's 10:00 p.m. hour, after she made some controversial comments about Marjory Stoneman Douglas High School student David Hogg, who has become a familiar face in the gun control movement. Despite the drama, the network "looks forward" to having her back. "We cannot and will not allow voices to be censored by agenda-driven intimidation efforts," Jack Abernethy, co-president of Fox News, told the Los Angeles Times on Monday. "We look forward to having Laura Ingraham back hosting her program next Monday when she returns from spring vacation with her children." "David Hogg Rejected By Four Colleges To Which He Applied and whines about it. (Dinged by UCLA with a 4.1 GPA...totally predictable given acceptance rates. )," she wrote. She offered an apology for her comments, but Hogg did not accept it. Nor, it seems, did several advertisers, who dropped her show. As the backlash was heating up, Ingraham lost Johnson & Johnson, Liberty Mutual, Office Depot, Expedia, Nestle and Hulu. It appears Hogg had something to do with it. Ingraham took this week off, letting several guests hosts fill in for her. While critics demanded Fox News fire her, it seems her job is safe.